Paperback, with flaps, 96 pages, 11.8 x 18.7 cm, 4.6 x 7.4 in. 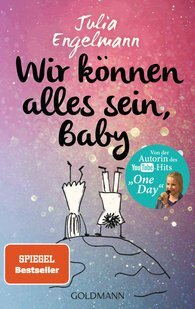 With One Day, Baby Julia Engelmann booked a sensational poetry slam success that thrilled millions on the Internet and became a bestselling book. It was her own very personal sound and distinctive language that went to the hearts of so many people. In her latest book, she has compiled an atmospheric playlist of poetical texts about dreams and love, about wishes and freedom, and also about letting go and sadness. Julia Engelmann writes sensitively and poignantly that we must not let our lives just slip by but instead should change something, put the world upside down, yes, simply do a handstand – all we need is a little courage. After all, "We Can Be Anything, Baby"!